Posted by Briana Hammontree on April 14, 2019 in News, Top Stories. Personalized tours are becoming a signature event for the future of Ferris’ campus. 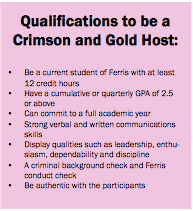 Established in the spring of 2018, the Ferris Crimson and Gold program matches incoming admitted students with current students who have the same major as them. “We want students to be a bit more comfortable on whether they’re coming here or whether they’re going to a different university. We obviously want them to come to Ferris, but we want Ferris to be a good fit for them, too,” Ferris Crimson and Gold Program Co-Coordinator and Admissions Recruiter Arielle Miller said. Incoming admitted students spend the day with their “matched” student, learning more about their program and campus life. Before Ferris pre-pharmacy freshman Robin Rodriguez was a “bone-afide” Bulldog, she had participated in the Crimson and Gold program her senior year of high school. That solidified her decision to attend Ferris. “In high school, it was nice because I was able to sit down in a classroom and sort of get the feel of things. Like, this would be how my day was if I went here. We came and sat in the UC [University Center] between classes and I was like, ‘You know, I’d like to come here. It’s a comfortable environment,’” Rodriguez said. Rodriguez discovered her experience with the program so rewarding, in fact, that she returned to participate as a host her freshman year at Ferris. “I got the email about signing up for Crimson and Gold, and I was drawn to it because I wanted students to get that same opportunity to help them out and answer their questions and set their days at ease, as well as helping them in making their decision on whether to come here or not,” Rodriguez said. Ferris students who participate as hosts within the program are required to do training in November before participating in the program during the spring semester. Hosts are also paid an hourly rate based on however long they are with their admitted students. Currently, there are 113 student employees for Crimson and Gold with 133 incoming admitted students registered to participate. Another former participant and current host is Ferris elementary education freshman Lilian Gray. 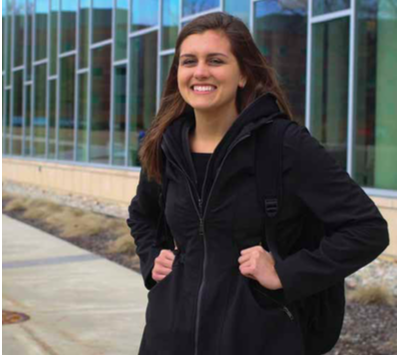 A first-generation college student, Gray’s experience as a participant within the program helped her attack some anxiety she had towards college. “I remember I was really scared. Like the night before I was panicking and was like, ‘Oh no. What if I realize college isn’t for me? What if I get there and don’t like it?’ But then I went to Ferris and within the first two hours I realized I loved this campus. I ran into people I knew, I really liked the classes, the class sizes were small,” Gray said. When Gray received the email highlighting the program’s allowance for students to participate as hosts, she joined instantly, hoping to help others like her. “I understood the issues some students may have when coming to tours because I wasn’t the best student in high school, but I’m doing better now. I just kind of want to spread the message that although you may not have done well in high school, it doesn’t mean you can’t succeed in college,” Gray said.